Woodland Scenics' Blended Turf (Earth Blend) is a Finely Ground, Colorfast, Nonmagnetic, Foam Material For Use in Creating Grass and Soil Effects. 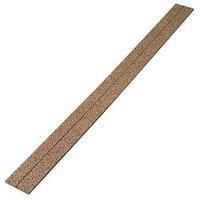 This is a O Scale Model Train Track Roadbed of Cork Roadbed from Midwest Products. It contains a total of 25 Strips of 3/16" x 2-5/8" x 36". For beginning or experienced collectors. This Pennsylvania Flat Car (#469530) is an HO Scale Model Ready to Roll from the Bachmann Silver Series. Suitable for Ages 8 & Older. 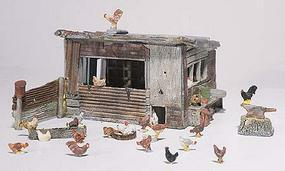 This Woodland Scenics Scenic Details Kit Contains A Chicken Coop That Can Be Used On Any HO Scale Model Layout. This is the Rail Chief Complete & Ready to Run Electric Train Set from Bachmann. Suitable for Ages 8 & Older. 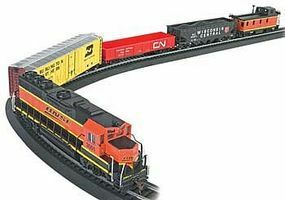 This an HO Set of Six 9" Straight Track Pieces from Atlas. This is a Set of N Scale Terminal Joiners from Atlas. This Package Includes Six 9" Straight Code 83 Snap-Track Pieces Designed for Use With Your HO Scale Railroad Layout by Atlas. This is the O Scale Standing Platform Passenger Figures Plastic Figure Set by Bachmann. Suitable for Ages 14 & Up. Woodland Scenics' Coarse Turf (Light Green) is a Colorfast, Nonmagnetic Foam Material For Use in Creating Grass and Soil Effects. Add Graphic Touches and Create Your Own Custom Layout with These Woodland Scenics R.R. Roman White Dry Transfer Decals. This Package Contains 2 Styrofoam Pieces of Risers that are 4" Tall by 24" Long. This is Step-1 among the simplified and improved 5-step layout system for beginners and advanced modelers. It's a Woodland Scenics Subterrain Lightweight Train Layout System for creating an outdoor environment. This Transcontinental Oil Company 40' 3-Dome Tank Car (#961) is a Premium Silver Series Model from Bachmann Suitable for Ages 8 & Older. This is the Structure Light (10-16V) from Faller.